Play with bricks talking about colours and build towers for babies to knock over. 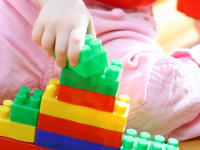 Encourage babies to build towers themselves. Use containers to put bricks in and out. This activity will help children learn by observation about actions and their effects. Create interest in pushing and pulling things, and begin to build structures. In this activity children are starting to build up knowledge and understanding of the world. This entry was posted on Tuesday, September 9th, 2008 at 3:05 pm	and is filed under Floor Activity. You can follow any responses to this entry through the RSS 2.0 feed. You can leave a response, or trackback from your own site.